Pope Saint Sixtus II (also called Xystus, meaning "polished") was bishop of Rome from August 30, 257 to August 6, 258. He died a brutal death as a martyr during the persecution of Christians by Emperor Valerian. According to the Liber Pontificalis, Sixtus was Greek by birth, although this is now disputed, since the authors of this work seem to have confused him with the contemporary Xystus who was a Greek student of Pythagoreanism. During Sixtus II's episcopacy, the struggle between the Catholic Church and Novatianism, a schismatic movement that refused to grant absolution to those who had committed idolatry under persecution, continued to rage throughout the Christian churches. The main accomplishment of Sixtus' papacy was to restore amicable relations with the African and Eastern churches, which had been strained by the policy of his predecessor, Stephen I, over the question of heretical baptism. 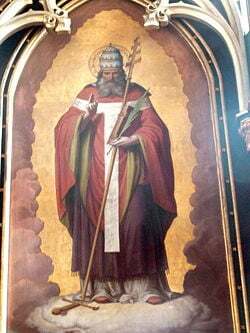 Sixtus continued to uphold Stephen's policy that baptisms administered by Novatianist clergymen were valid, but he was nevertheless able to end the animosity of Catholic churchmen opposed to Stephen's policy, especially Cyprian of Carthage. Sixtus carried out his duties despite the initial wave of persecution under Emperor Valerian I. However a new and harsher edict in August 258 resulted in Sixtus becoming one of the persecution's first martyrs. He was beheaded on August 6 with several companions. Ironically, the antipope Novatian also apparently died during the same persecution. Sixtus II is referred to by name in the Roman Canon of the Mass. Today, he and his companion-martyrs are commemorated with an optional memorial on August 7. Although the Liber Pontificalis says that Sixtus II was Greek, modern Catholic and secular scholars consider this to be in error, resulting from the fact that the authors of this source thought that he was identical with a contemporary Greek philosopher of the same name, the author of the so-called Sentences of Xystus. During the episcopacy of his predecessor, Pope Stephen I, a sharp dispute had arisen between Rome and the African and Eastern churches concerning question of whether Novatianist schismatics needed to be re-baptized if they sought admission to the Catholic Church. The future Saint Cyprian of Carthage had pointedly disagreed with Stephen I on the issue. As if the Novatianist schism itself were not bad enough, the controversy over heretical baptism now threatened a complete rupture between Rome and the churches of Africa and Asia Minor. Although Sixtus upheld Stephen's position that the Novatianists only required absolution and not re-baptism, he was more conciliatory than Stephen had been and succeeded in restoring friendly relations with Cyprian and his followers. Exactly how he did so is not clear, but Pontius, Cyprian's biographer, calls Sixtus a "good and peaceful priest"—bonus et pacificus sacerdos—indicating that his style, at least, was less offensive than his predecessor's (Vita Cyprian, xiv). Shortly before Sixtus II became bishop, the Emperor Valerian issued his first edict of persecution, which required the Christians to participate in the national cult of the pagan gods and forbade them to assemble in the cemeteries. Those who refused to comply were threatened with exile or death. Nevertheless, during the early part of his reign, Sixtus managed to perform his functions as chief pastor of the Roman Christians without being molested by those who were charged with the execution of the imperial edict. According to a later legend, one of the deacons appointed by Sixtus II was the famous saint and martyr Lawrence of Rome. Lawrence was placed in charge of the administration of church goods and the care of the poor, and one of the items he had charge of was the famous chalice of Christ known later as the Holy Grail. However, during the first days of August, 258, the emperor issued a new and far more harsh edict against the Christians. It authorized that bishops, priests, and deacons could be summarily put to death without trial. Cyprian informs us that "the prefects of the city were daily urging the persecution in order that, if any were brought before them, they might be punished and their property confiscated." As a result of intensified efforts by the emperor's agents, Sixtus II was one of the first to fall victim to this imperial policy. Hoping to escape the vigilance of the Roman officers, he assembled his flock on August 6 at one of the less-known cemeteries, that of Prætextatus, on the left side of the Appian Way, nearly opposite the famous cemetery of Saint Callixtus, where Christians often congregated for worship in the presence of the holy martyrs. While seated on his chair in the act of addressing his flock, he was suddenly apprehended by a band of soldiers. Some sources say he was immediately beheaded, others that he was first brought before a tribunal to receive his sentence and then led back to the cemetery for execution. The inscription which Pope Damasus I (366-384) placed on Sixtus' tomb in the cemetery of Saint Callixtus may be interpreted in either sense. The Liber Pontificalis claims that he was led away from the place in order to induce him to offer sacrifice to the gods. 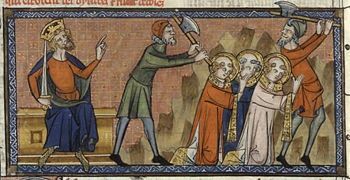 Four deacons, Januarius, Vincentius, Magnus, and Stephanus, were apprehended with Sixtus and beheaded with him at the same cemetery. Two other deacons, Felicissimus and Agapitus, suffered martyrdom on the same day. The order of Valerian made no distinction between Catholic and Novatianist sects of Christianity, and thus the antipope Novatian, seems to have died in the same persecution with his rival. A legend cited by Saint Ambrose of Milan says that, on his way to his execution, Sixtus II met his deacon, Saint Lawrence of Rome. "Where are you going, my dear father, without your son?" Lawrence asked him. "Where are you hurrying off to, holy priest, without your deacon? Before, you never mounted the altar of sacrifice without your servant, and now you wish to do it without me?" The pope is reported to have prophesied that "after three days you will follow me." The story is dismissed even by such sources as the Catholic Encyclopedia as "probably a mere legend." Even more doubtful is the statement of the late fourth-century Christian poet Prudentius that Sixtus II suffered martyrdom by crucifixion. "At the time when the sword pierced the bowels of the Mother (Church), I, buried here, taught as Pastor the Word of God; when suddenly the soldiers rushed in and dragged me from the chair. The faithful offered their necks to the sword, but as soon as the Pastor saw the ones who wished to rob him of the palm (of martyrdom) he was the first to offer himself and his own head, not tolerating that the frenzy should harm the others. Christ, who gives recompense, made manifest the Pastor's merit, preserving unharmed the flock." An oratory was erected above the cemetery of Saint Prætextatus at the spot where Sixtus was martyred, and was still visited by pilgrims of the seventh and the eighth century. Later tradition conflated Sixtus' martyrdom with that of his predecessor Stephen, who probably died a natural death. Sixtus I is also often confused with Sixtus II. For some time, Sixtus II was believed to be the author of the so-called "Sentences," or "Ring of Sixtus," written by the Pythagorean philosopher named Sixtus and later revised by a Christian editor. This error arose because in his introduction to a Latin translation of these "Sentences," Rufinus ascribes them to Sixtus of Rome, bishop and martyr. However, it is certain that Pope Sixtus II is not their author. He was also once thought to be the author of the pseudo-Cyprianic writing Ad Novatianum, though this view has not found general acceptance. 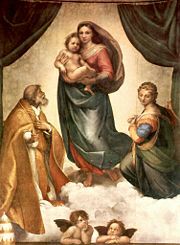 Another composition written at Rome, between 253 and 258, is generally agreed to be his. Kelly, John N. D., and Michael J. Walsh. The Oxford Dictionary of Popes. Oxford [u.a. ]: Oxford Univ. Press, 2005. ISBN 9780198614333. Loomis, Louise Ropes. The Book of Popes. (Liber Pontificalis). Merchantville, NJ: Evolution Publishing. ISBN 1889758868. Maxwell-Stuart, P. G. Chronicle of the Popes: The Reign-by-Reign Record of the Papacy over 2000 Years. Thames & Hudson, 1997. ISBN 0500017980. History of "Pope Sixtus II"